Kate Dolan began her writing career as a legal editor and then newspaper columnist before she decided she was finally ready to tackle fiction. 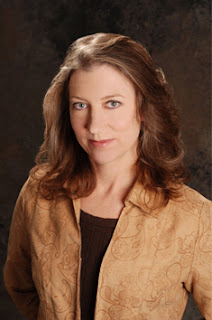 As the author of more than a dozen novels and novellas, she writes historical fiction and romance under her own name and contemporary mysteries and children's books under the name K.D. Hays. When not writing, she enjoys volunteering as a living history interpreter and riding roller coasters with her daughter. Her latest book is the cozy mystery, Roped In. Connect with Kate on Facebook and Twitter. Life has settled into a more stable pattern for fledgling investigator Karen Maxwell of DS Investigations, but that stability is precarious. At work, she has an uneasy truce with Rodney, the “office maximizer” hired by her brother to do some of the administrative work she used to do. Her brother has not assigned her any real cases and she thinks it's because he doesn’t trust her after she was fired from her last major assignment. But she soon gets her chance. The firm's insurance agent calls in a favor and asks them to investigate whether a valuable parrot was killed as a result of snowfall damage to a house. Karen is pretty sure Dave will assign this to her, since the investigation will involve no money or prestige. But it may help earn back his confidence. Then Gina Callaghan hires DS Investigations to find out who sabotaged her daughter Hayley’s rope at a jump rope competition. Hayley competes in power jumping events, and she failed to make the top four in the regional tournament. If Karen can prove that one of those top four jumpers behaved unethically, then Hayley, (who was fifth) will have a spot at the national competition, and a chance to go to the World tournament. Dave assigns Karen the lead role in this case, so now she has a chance to prove to her brother that she can conclude an investigation before the client is ready to pull the plug. Karen bribes her son to take a jump rope class on the day when the jumpers she needs to watch have their practices. Initially, Hayley Callaghan does not want the matter investigated so Karen has to be a subtle as possible. Meanwhile, in the parrot case, Karen's investigation seems to indicate that the parrot's owners are telling the truth and not trying to defraud the insurance company. But the picture they offer as proof somehow arouses Karen's suspicion. At jump rope practice, she finds a lot of masked hostility and a host of possible suspects, but no one who saw anything. Then Hayley's sister steps forward and admits that she saw someone rummaging through her sister's rope bag. Circumstances point to two possible suspects, in addition to the sister herself. But Karen can find no proof of wrongdoing and thinks the break was most likely an accident. Then Hayley changes her position and urges Karen to follow through with her initial suspicions. She immediately wonders why. But she doesn't have time to wonder. Her brother insists that she stop working on the insurance case and her client insists that she write up suspicions against one of the other jumpers so they can file a complaint with the national sanctioning commission. Working against the clock, Karen finds proof that the picture is fake, proving that the insurance clients were trying to defraud the agency. 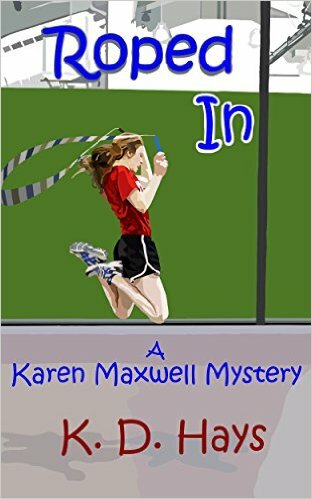 But time runs out on the jump rope investigation—once again the dissatisfied client fires Karen before she solves the case. This time, she knows an innocent girl is going to face blame and could be banned from the sport she loves. So she digs on until she uncovers the truth —and possible destroys a family in the process. Roped In is available at Amazon. Thanks for inviting me to your site! I’m a history nut so I love to explore historic sites and participate in living history events. I also like to keep moving with activities like karate or taking long walks with my dogs. But over the past ten years, I’ve probably spent most of my free time in the world of my kids. When they were really young, I had to take time to care for them and basically make sure they didn’t burn down the house or break their necks jumping off the top of the slide. I took time to write or participate in living history activities to get a break from the caretaker role and to spend time with adults. As my kids grew older and more independent, however, I found that I seemed to be devoting even more time and attention to them—probably because I didn’t have to. I knew my time with them would be so short and it absolutely could not be repeated. So instead of dressing up in 18th clothing and cooking over an open hearth, I found myself watching baseball doubleheaders and coaching jump rope shows. My son is in college now and my daughter is a senior in high school, so that phase of life is drawing to a close and I’m starting to delve back into my own hobbies more. But the very best of times is when I get to combine my interests with family time, such as when we all camp together at a historical reenactment. And of course, there are roller coasters…. I have been writing stories since I was in grade school, but I always used to get tired of my stories and ended up cutting them short or just never finishing. When I was in my late 20s, I began to conceive ideas for full length novels and plays and thought I was ready to write. I wasn’t. I still kept ending up with characters I hated. Finally, when I was in my early 30s (with two very young children) I finally felt like it was time – I was ready to commit to writing a whole novel. This is really tough question. I love to travel and different places usually give me ideas for situations that turn into stories. So to pick one place is really difficult. But I’m going to choose Pitcairn Island, where the mutineers from The H.M.S. Bounty settled after they left Tahiti. Like so many others, I’ve been fascinated by the story of the ill-fated voyage. I also think I would find it interesting to write about people living on the island now – trapped in the legend of their past, dependent on tourists and scholars that they despise. I would grab my daughter and head to the nearest amusement park for some coaster time. We both love roller coasters. If I could be a professional coaster rider I would be in heaven! Ireland. I think it would be fun to set a story during one of the many time periods when Dublin was inhabited by one culture (Vikings, the British, etc.) and the area beyond the pale was home to entirely different (and resentful) culture. Back to your present book, Roped In, how did you publish it? Roped In is my tenth full-length novel and the first one that I have published myself. It was originally proposed as the third book in a mystery series that was part of the Heartsong Presents – Mysteries series from Christian publisher Barbour Books. But Barbour cancelled the series before I had written any more than the first three chapters and the synopsis. I went on to other projects. But when an agent proposed re-releasing the mysteries as an ebook series, I considered going back to write the third book. I knew I’d be on my own with this one – so it took me a little while to commit. I don’t know if I was scared or lazy. Maybe both! Why was writing Roped In so important to you? Eventually I realized it was important to finish Roped In because jump rope had become such an integral part of my life. My daughter first saw a precision jump rope performance in 2006, and she was entranced. She came home and immediately tried to jump rope on a ball in the living room. I took away the ball and insisted that she learn to jump without the ball – and outside –first. But that was the start of ten year journey through the world of a sport most of the world has never heard of. Within a couple of years, my daughter was performing and I was coaching jump rope. It was at that point that I pitched the idea of a jump rope mystery to my editor at Barbour. But it wasn’t until a few years later that she actually started competing and I began judging competitions. We started living the experiences of the characters I had proposed! So I had to go back and finish the story. Over the years, we have traveled to a number of places for jump rope workshops and competitions so of course those experiences added to the knowledge I drew on when writing Roped In. I wrote part of the first draft while we were at the USA National Competition in Long Beach, California. Well of course I’m not at all sure what my best ideas are. But I tend to get “hit” by ideas when I’m traveling and a place evokes a situation in my mind. I think my subconscious does a lot of the work in developing stories. Now I just need to train it to type, because it still boils down to how much time I put in the chair and focus on my story rather than reading email or watching cute penguin videos on Facebook. Thanks to modern technology, the dream of seeing your own book in print is within reach for any writer who puts in enough time to finish a manuscript. But you will be much more satisfied with your book if you force yourself to expose your words to criticism from peer reviewers and editors. Often the advice we don’t want to hear is exactly what we need to hear to make a story stronger. Be willing to step away from your project for a while and consider proposed changes. Thanks for reading this far! I’m honored that you’ve given up some of your very precious time to learn a little about me and my book. If you read Roped In, I’d love to know what you think of it! Thanks for having me on your site today! Hmmn now it looks like I said something embarrassing so I had to delete it. But actually for some reason my first comment posted twice so I just removed the second one. Thanks for hosting Kate today!